This is a guest post by Bryan Gushikawa. Lamy is a German company with a long history of making stylish and practical pens. Their lower end pens (like the AL-Star and Safari) are excellent and durable daily writers, but the Lamy Logo eschews the larger body styles of these pens for a slimmer, more elegant design. Writing comfort and performance aren’t affected, though. This pen is a definite eye catcher and I received several compliments on it when I took it to school. The fit and finish are perfect and the spring clip only reinforces the quality that Lamy has perfected over its storied run as one of Germany’s top fountain pen makers. Smoothness: The Lamy nibs run wide compared to Japanese nibs, so this M writes like a B. It is smooth and is a good, stiff nail to push through carbon copies with. There is a little squeak and sound of the nib on paper, though. All Lamy nibs have this, so this is a manufacturer trademark. Grip and Balance: The textured metal fore section is nice to hold, but the pen can seem a little slender for folks with larger hands. The balance when posted is excellent and the metal body doesn’t feel so slippery. For daily writing, the good balance will reduce fatigue. Ink Flow: A solid, steady 0.8mm line. No skips or blotches. Flow was good from the start. Build Quality: German quality, all the way. Solid threading, good heft and a superior clip with a SPRING in it. You will really enjoy just looking at and holding this pen to admire its quality. Clip: The best clip on any fountain pen has a spring. This has a spring. This is the best clip on any fountain pen! Post: Posts securely to a plastic nub on the back end. Although the post is shallow, it’s tight and the cap won’t fall off while writing. Overall: If you’re into German engineering, this pen is excellent value for the money. Although I prefer Lamy’s EF nibs to Ms, the smoothness and feel of this pen is too good to pass up. I used Lamy Blue in cartridges for this review, but with a converter, you can check out their Blue Black and Red which are two highly regarded colors. A strong recommend on this one! Posted on September 9, 2011 by Brad Dowdy and filed under Fountain Pens, Guest Post, Lamy, Logo, Pen Reviews. So, how many pens did Carmen send me from her European vacation anyway? Needless to say, it was a serious hookup, and I am down to the last couple that I need to review. I have honestly carried this Lamy Logo ballpoint in my review case ever since she sent it to me, but just now started giving it a workout. When I finally started using this pen, it posed a couple of problems for me. First of all, the grip section is too high on the pen for my writing style. There is a good bit of distance between the end of the grip and the tip of the pen, and since my writing style causes me to grip the pen low, the ridge where the tip screws on to the barrel hits me in the middle of my finger pads. This wouldn't be a problem for people with a more free flowing writing style than mine, but it is a little bit of an issue for me. Secondly, and this is actually a bigger deal for me, is that the tip of the pen does not have a tight fit around the opening of the barrel when the cartridge is in the writing position. This causes some movement when writing, which of course translates into that "click-clack" sound when the pen hits the page. I don't want to sound like I am being too harsh on this pen - it is a very nice entry level Lamy pen that you can find in the $12 range. It just doesn't fit me or my writing style as well as many other pens I have reviewed. And that is what it is all about, right? 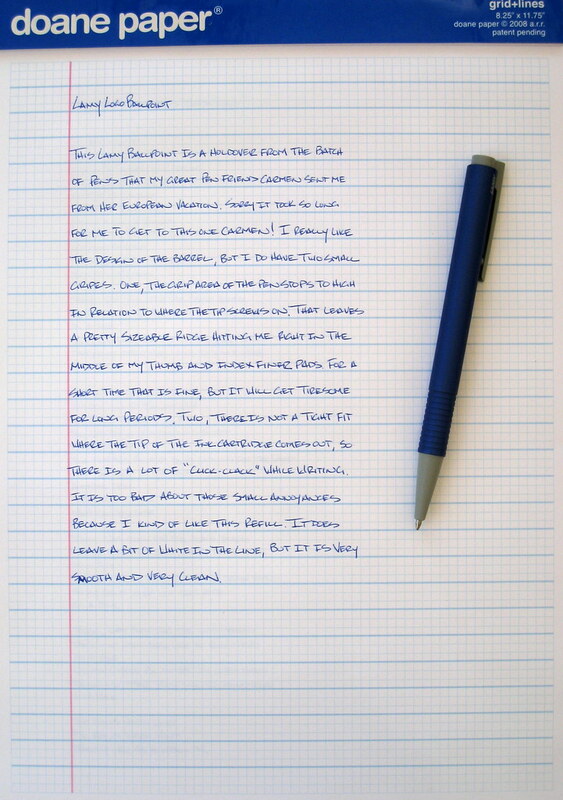 Posted on August 2, 2010 by Brad Dowdy and filed under Lamy, Logo, Pen Reviews.